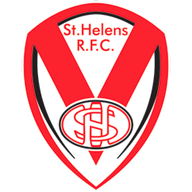 St Helens were expected to face a serious examination on Friday, against a Warrington side on a run of five consecutive victories. But Justin Holbrook's side were in a class of their own as they eased to a 38-12 win. 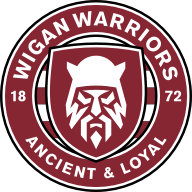 It was a hugely impressive result and their dominant performance marked them down as the team to beat in the Super League. 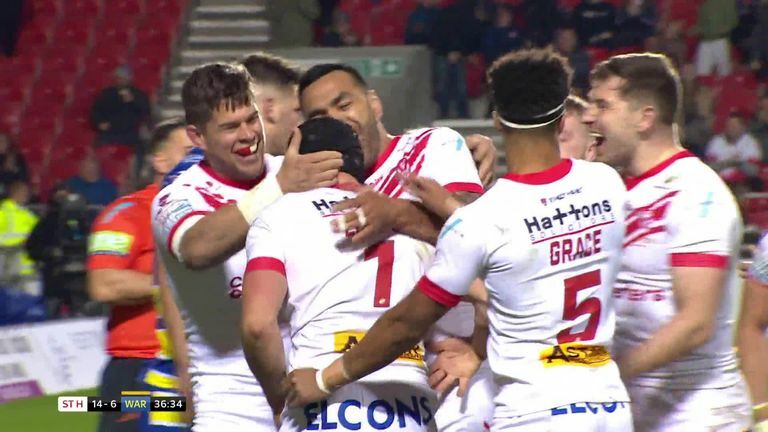 St Helens made an excellent start to last season and ended empty-handed as they missed out with another semi-final defeat, but this display was another reminder of their potential as they bid to win silverware. Wakefield came away with a 30-20 victory over Wigan on Friday but head coach Chris Chester was far from happy with the tactics of the struggling champions. The hosts lost four players to injury during the win and Chester was aggrieved with the way in which they were forced out of the game. Chester said: "I'm really disappointed the way we lost a couple of those blokes. "We've lost four blokes. It's a tough one and kind of takes the gloss off the result." 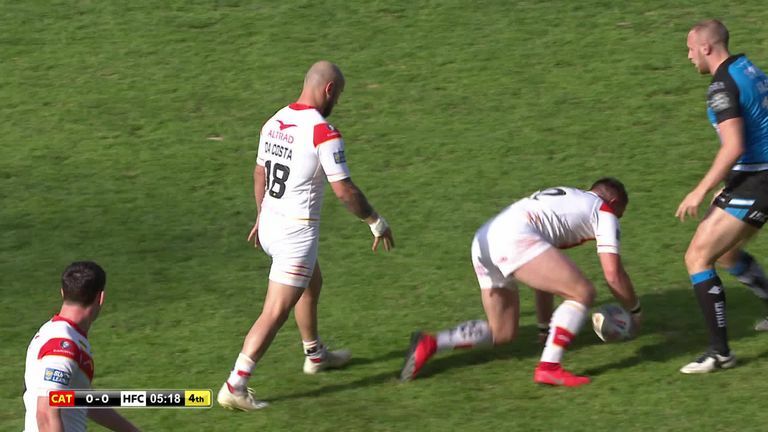 Marc Sneyd kicked the history-making Golden Point earlier in the season and he was at it again on Saturday with the decisive contribution for Hull. Sneyd showed he is the man for the big occasion after kicking the winner in Hull's dramatic 31-30 victory over Catalans. His coach Lee Radford described Sneyd as 'the Iceman' after firing Hull to the first golden point victory in the Super League in their win over Wigan in February. Sneyd has built a reputation for handling the pressure and opponents will no doubt be fearing the worst if their game against Hull heads into extra time. Halifax reached the sixth round of the Challenge Cup after dumping Super League side London Broncos out of the competition. Their 24-16 victory was all the more impressive after being without half a dozen of their first choice regulars. Halifax's last Challenge Cup triumph came in 1987 when the Lance Todd trophy was won by the Manly great full-back Graham 'Wombat' Eadie. Halifax fans are currently raising money for the unwell Eadie, as he needs a heart operation. Eadie will have been delighted by their cup upset against the Broncos and the goodwill of the Halifax supporters. Manly are finding their form in the NRL after clinching their third successive victory. 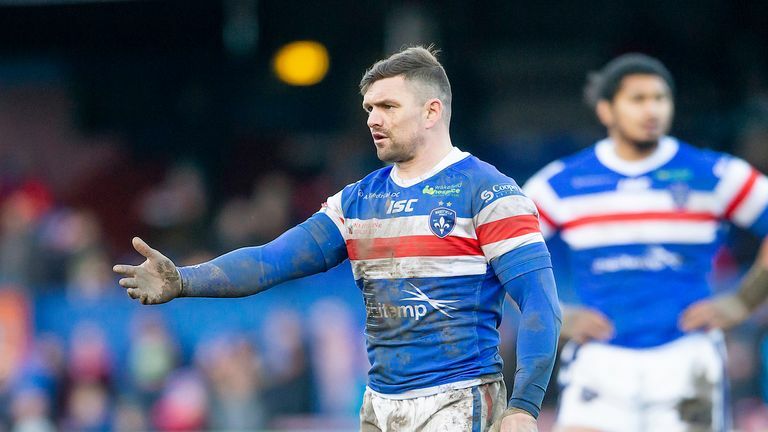 A 26-18 victory over Newcastle on Saturday was their latest win after surging into an 18-0 lead. It was the ideal way for captain Daly Cherry-Evans to celebrate his 200th game and another sign Manly are heading in the right direction after losing their first two games. Coach Des Hasler said: "It's only round five. We've got a long way to go. We're still building. We're thereabouts. We're in amongst it. "I just thought that given our start, and we were probably in a position to maybe win one of those games, it's just good to get a little bit of momentum, and to pick up three wins is important." Cameron Smith made history after becoming the highest points scorer as Melbourne Storm extended their winning run this season to five games. Smith landed a penalty goal to take his career tally to 2,420 points, which surpassed the previous mark of 2,418 held by Hazem El Masri for the Bulldogs. His record-breaking kick helped Melbourne edge to an 18-12 victory over North Queensland Cowboys to keep them top of the NRL.